Update #2 (1/14): We have scheduled and opened registration for the February Beginner series! See this post for details and a link to the registration form. Update (1/4): Although we have reached capacity for this Beginner series, we are thrilled that there are so many of you who would like a structured introduction to yoga! Therefore, we are working to schedule another 4-week series in February and will announce the details when we’ve finalized them. With the start of a new year, some of you may be looking to learn more about yoga and its many benefits and to try it out in a friendly and welcoming environment. Or perhaps you have been away from your practice for awhile and would like a structured re-introduction. Angie invites you to join her for our January Beginner series, meeting each Saturday at 11 a.m. We have all the supplies you need at the studio, including mats. Please register by completing this brief online form. 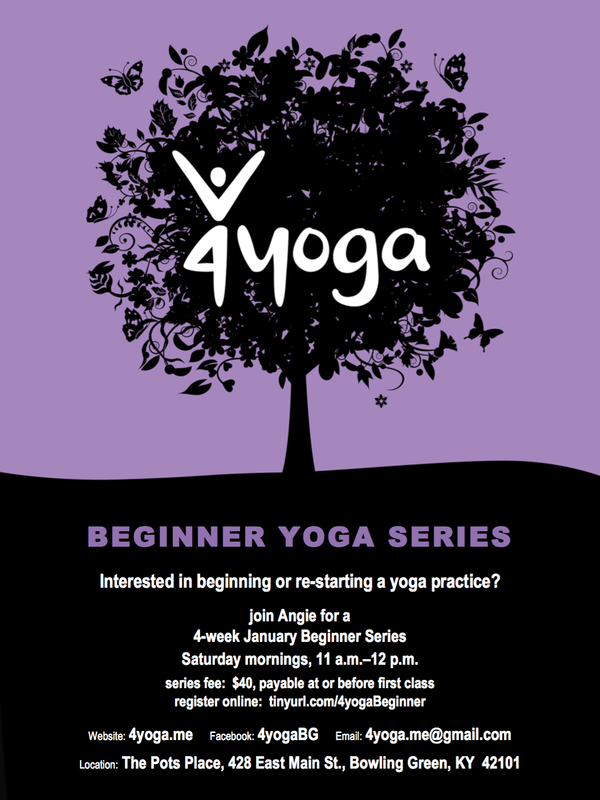 If you have any questions about this series, please post a comment here or email us at 4yoga.me@gmail.com. We look forward to introducing or re-introducing you to yoga in 2017! Image | This entry was posted in beginner, beginner series, community, new class, schedule and tagged Angie Jones, January. Bookmark the permalink.